Service clubs in Kirksville, Missouri came together on Tuesday, November 24 to celebrate their commitment to service in the community. This year the Kirksville Optimist Club hosted the annual event. Other clubs participating were Kirksville Women of Today, Kiwanis International of Kirksville, Rotary Club of Kirksville, Quota International of Kirksville, Sojourner's Club, and Kirksville Thousand Hills Rotary Club. The clubs come together annually to share fellowship, stories and accomplishments and to outline goals for the future. "This is an opportunity for everybody to get together and just be happy about what we do," explained master of ceremonies and Optimist Club member Scott Meredith. Brand loyalty - that's what you hope to achieve when you establish any event, but especially a fundraising event. And that is just what has happened for the Optimist Club of Windsor, Colorado. For thirty years, the Optimist Club and the Quality Quilters of Windsor have combined forces to coordinate the best community craft show around. This year 88 vendors helped them attract more tha 2,500 patrons by 10 am on opening day. In addition to collecting exhibitor fees and lining up sponsors, the clubs also share in the $2 entry fee from attendees. It's a simple way for the community to donate to the nonprofit efforts of the Optimist Club. The Optimist Club of Bismarck, North Dakota is offering Breakfast with Santa on December 5 at the Bismarck Civic Center. Co-sponsored by the Bank of America, the event is a fundraiser for the Optimist International Childhood Cancer Campaign. Children and adults can enjoy breakfast with Santa and Mrs. Claus. The donations are $5 for children and $8 for adults. All children will receive a gift from Santa. Tickets can be purchased at the Bank of America Center. The Santa Rosa Education Foundation in Gulf Breeze, Florida has partnered with the Gulf Breeze Optimist Club, Mediacom Communications and Gulf Power Foundation to provide grants for teachers that will assist them in supporting student engagement and achievement. Fifteen teachers in Gulf Breeze received awards and 134 teachers in the county shared the $33,500 treasure. Helping students achieve success in schools is just one way that Optimist Clubs members bring out the best in children. 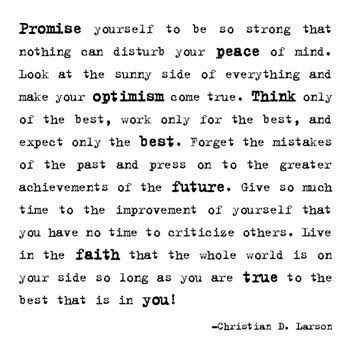 Inspiring optimism is my favorite thing. Sharing stories and experiences so that others can learn, grow and do more is what makes our world compassionate and progressive. This one-minute video is a perfect way to pass the spirit of optimism forward. Please share it with your friends. Optimism...pass it on. The Foundation for a Better Life is a 501 (c)(3) nonprofit organization also known as Values.com. They are privately funded and non-commercial. Their sole objective is to promote positive values, using print and broadcast media. 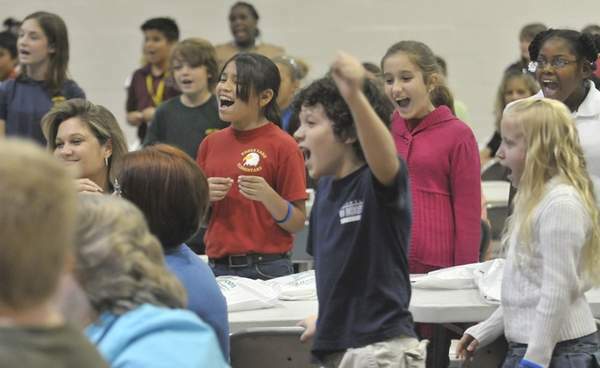 One hundred and fifty elementary school students were treated to a special day courtesy of the Optimist Club of Winter Haven, Florida as part of Optimist International's worldwide celebration of Youth Appreciation Week. Four teachers joined the students representing 75 schools in the community. Following the "do the right thing" model, these students were recognized for being "good kids." According to program chairman Larry Powell, the Optimist Club was not looking for straight A students or acclaimed athletes. They wanted to recognize students that often go unnoticed, but are good citizens who do the right things every day. The special treat for the students was a motivational presentation from two guest speakers: Rick Dantzler who spoke about literacy and reading and Otis Anthony, Senior Director of Diversity Management with the Polk County School Board who made a dramatic speech about being an eagle. "When you are an eagle, you are a beautiful person, a magnificent person and you can soar," he explained. Donna Kelley, a reporter with newschief.com was on hand to record the events. Please read her account of the activity in the great online article here. The picture was taken by George Aycrigg of the News Chief. The most traditional Optimist Club Youth Appreciation celebrations recognize students for good grades, extracurricular activities and attitude. Here are some Optimist Clubs that recently received some excellent press coverage for their recognition of students in their community. In the Niagara Falls area, twenty-seven students were recognized. In Azle, Texas, students from ten area schools were honored. In Alamogordo, New Mexico, the Mayor's Youth Council were given kudos. In Council Bluffs, Iowa, eighty-five students were given recognition. More celebrations are going on in communities throughout the world. Watch your local newspaper and send us your stories! Students at the Mountain Bay Elementary School in Everest, California received dictionaries courtesy of the Optimist Club of Everest. The gift went to all third grade students in the school district. According to Optimist Club member David Kryshank, the children enjoy books and having a book of their own that they can take home is even more appreciated. The program is part of the National Dictionary Project that has given away more than 10 million books. The City of Auburn, Washington has published their Christmas festivities schedule and front and center is the Auburn Optimist Club. Auburn Optimist Club members are Santa's very special helpers because they maintain his Auburn home throughout the year. The Auburn Santa House has been an Optimist Club tradition for forty years. These happy elves are promoting the Santa's visit and offering photos with the jolly old elf himself before and after the parade. Located in the B Street Plaza; the Santa House will be open though Dec. 23, with weekday hours of 3 - 6 p.m. and weekend hours of noon to 6 p.m.
That's a lot of pancakes! This just in...As reported in an earlier post, the Optimist Club of Rome, Georgia is holding a pancake fundraiser today. I just learned it is their 50th Annual Pancake Breakfast. You have to admit, that is a lot of pancakes! According to organizer Jim Bojo, each year the club tries to beat the past year's sales because the pancake breakfast supports all of the club's projects for the year. Target for this year's event is $18,000. Help them reach their goal starting at 6:00 am, November 21, 6 a.m. at the Rome Civic Center on Jackson Hill. Pine Bluff, Arkansas...The Optimist Club of Pine Bluff Arkansas recently donated $10,000 to the CASA Women's Shelter capital campaign. The only women's shelter in the community is trying to raise $700,000 for a facility that can house up to 60 occupants, twice the size of the current facility. I like seeing such donations for they emphasize how an Optimist Club can truly make a difference in a community. It takes a healthy community to bring out the best in kids. The Optimist Club of Hernando, MS became the latest Optimist Club to join the "Do the Right Thing" movement. They chose to recognize children in the Hernando Middle School for turning in their homework and never being sent to the principal's office. About 80 kids were treated to a pizza party for their efforts, but middle school teacher Jeannie Booher says that the acknowledgement will stay with the children a lot longer than that. “Sometimes these kids go home and nobody tells them what a good job they have done,” Booher said. “I’m tickled to death that the Optimist Club did this." November is Youth Appreciation time for Optimist Clubs. Optimist Clubs perform projects that involve, benefit or recognize youth throughout the year, but at this one time every year, most Optimist Clubs try to do a special project that promotes something special for children. The Noon Optimist Club of Laredo, Texas held a job shadow day for teens and one lucky student, Elijah Fuentes of Alexander High School got to be Border Patrol Chief for a day. The Optimist Club of Warsaw, Indiana raises approximately $20,000 for the youth-oriented projects they carry out each year in the community. They meet weekly to share their fellowship, strengthen their mission, and plan for the activities that they have committed to perform. According to their website, the average attendance at their meetings is approximately 70 members plus guests. As I've read through bulletins, blogs and websites, I have to say that is possibly the highest attendance that I have seen at a club that follows the weekly meeting model. I think it's because they embrace exciting projects that are relevant to their community. With at least 25 ongoing projects, they truly engage with each other and with the Warsaw community. Read about their great projects here. Keep doing what you are doing, Warsaw Optimists! Great job! Are you ready for a Christmas parade? The Chamber of of Commerce, Convention and Visitors Bureau, KHBR radio station and the Optimist Club of Hillsboro, Texas are! This past weekend they kicked off the advertising encouraging folks to participate in the parade that will take place on December 9. 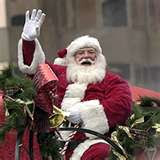 Entries are now being accepted for the "Old Fashion' Christmas" parade. What is exciting about this announcement to me is that as well as providing a fun family activity, the groups are asking people to donate to two causes so that the spirit of Christmas can live on. First is the Optimist Club Christmas for Kids program that asks for toy donations and the second is the Interfaith Ministries canned food donation request. Yes, the season of giving is here. Cheers! Optimist International has launched a new program to help keep children safe online. The best part about this program is it is truly designed to reach adults and encourage discussion between parents, guardians and their children. Watch the introductory video here and then contact your local Optimist Club for a full presentation. Ever wonder about how an Optimist Club appears to an outsider? How about a young woman who is representing youth and young adults as a spokesperson through the Miss America organization? Meet Angela Venditti. She is serving as Miss Oakland County, Michigan for 2009-2010 and her personal message about empowering youth is an ideal complement to the mission of Optimist Clubs. Miss Oakland County recently visited the Waterford Optimist Club and told them about an early drug prevention program aimed at students in kindergarten! So what did she think of her visit to an Optimist Club? She said, "In my two visits to Optimist Clubs in Oakland County I've noticed two consistencies: they meet bright and early (7:00 am) and are a lively group of people who are always upbeat and happy!" On behalf of my happy, early-rising Optimist friends, thank you Ms. Venditti for sharing your positive message. The Optimist Club of Meridian, Mississippi has developed a relationship with the local television station WTOK and together they help make Meridian a better place to live. Since 2006, the Optimist Club of Greater Vienna, Virginia has held the "Walk for Growing Hope" as part of Optimist International's Childhood Cancer Campaign. The event takes place annually on the first Saturday in October. More than $140,000 has been raised since its inception. Twenty-five percent of the funds have been forwarded to the Johns Hopkins Research Hospital and 75% has remained in the community to help local children diagnosed with cancer and their families through Growing Hope, a nonprofit organization that helps educate families, entertain the patients and provide support to the entire family affected by the cancer diagnosis of a child or sibling. Find out more about the Walk for Growing Hope here. Would you like a children's identification kit with that? On November 21, the Noon Optimist Club of Rome, Georgia will serve up their annual pancake breakfast for the community. And this year, they will also serve up something special for families with children: a child identification kit. The Floyd County Sherrif's Community Posse is bringing this event to the pancake breakfast as part of the Sherrif's Youth Initiative Program. Partnering with the Optimist Club was a logical choice because the motto of all Optimist Clubs is to be a friend of youth. Statistics reveal that more than 800,000 children go missing every year. The child identification kit provides up-to-date photos and fingerprints of your child and helps adults learn to store such information in an easily accessible place in case it is needed. It also opens a dialogue between parents, children, police, and others about the vulnerability of our children so we can all work together to keep kids safe. Adults are required to provide proof of their relationship to the children who receive kits. WEST SUBURBAN OPTIMISTS — Over the past 54 years, the West Suburban Optimist Club of west suburban Cleveland has done a lot for the community. In the 1960s, the club began the Shoes for Kids program, holiday food baskets for needy families, a picnic for visually impaired students from the Cleveland Municipal School District, as well as helping Ohio Boys Town. In the 1970s, the group built and operated the first northeast Ohio Haunted Forest in Strongsville. The club donated a 15-passenger van to Our Lady of the Wayside, and donated money to organizations like Providence House, the Ohio City Crisis Nursery, and Ohio Boys Town. Through the 1980s and 1990s, the community outreach continued. Today the group sponsors the Cleveland Metroparks fishing derby and other programs such as Respect for Law, which honors law enforcement officers and judges; Youth Appreciation, honoring local students for their community work, and an annual essay contest for local students. The group meets at 7 p.m. on the first and third Thursdays of each month at Anthony’s Restaurant, at the corner of Pleasant Valley and York roads in Parma. Each year, the West Suburban Optimist Club gives out six or seven scholarships to deserving area students, including one to a special education student at Lincoln West High School. The group promotes an optimistic way of life in its members, young people and the community. Call Joe Giampietro at (440) 390-1214, or Don LeHotan at (440) 734-4245 for more information. Thanks Mr. Hasse. Optimist Clubs appreciate your support. We don't live in the moment, but rather we live for the moments; those moments that give us hope, spread joy and allow us to share our optimism. We treasure such moments for they are life. Optimist International made a commitment to fund research at Johns Hopkins Research Hospital to eradicate childhood cancer in 2001. To date Optimist Clubs in the United States have given more than $1 million to that cause. But the really exciting part of that commitment was the ongoing efforts that Optimist Clubs are conducting in their communities, on a local level. In Boise, Idaho, the Noon Optimist Club has an ongoing commitment with St. Luke's Hospital and the Mountain States Tumor Institute (MSTI) to fund a program called "Beads of Optimism." The beads are like a charm bracelet or necklace. 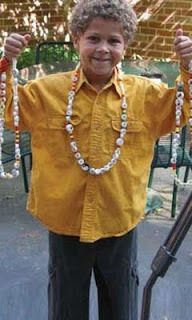 Children are given beads to symbolize different stages in their disease and recovery. They are even given beads for the moods they are feeling. According to a hospital spokesperson, this program makes a difference because it helps children talk about their experiences with others. 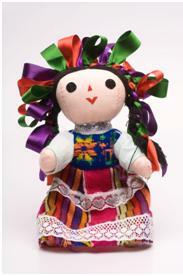 By showing the beads, they can tell the story of why they received it. Thanks to the Boise Noon Optimist Club and all other Optimist Clubs for making a difference through the inspiration of the Optimist International Childhood Cancer Campaign. It's the first week in November. Can you believe that it is less than 50 days until Christmas? That means pretty soon many of us will be looking for a Christmas tree and many Optimist Clubs will be busy with their major fundraising effort of the year. 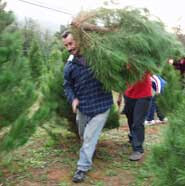 For some clubs, the tree lot can mean up to 80% or more of their income. With that revenue they fund youth serving projects throughout the year including sports programs, essay and oratorical contests, respect for law, youth appreciation and many more projects that bring out the best in children. I'm sure it will come as no surprise to you; I'm buying my Christmas tree from an Optimist Club. I hope you do too. The Optimist Club of Marco Island, Florida, and the American Cancer Society of Marco Island recently held a 50-50 raffle to raise funds for R.O.C.K - Reaching Out to Cancer Kids Camp. The event was held during the youth football games at Winterberry Park on October 31 with the lucky winner receiving their prize that day. But the real winners are the children who will be able to go to R.O.C.K where they get to feel like normal kids again. At camp, there are counselors, health care providers and volunteers who make sure that every one fits in. Many are cancer survivors themselves. Some of the activities that the children enjoy include swimming, fishing, horseback riding and arts and crafts. They also learn about independence and coping skills. Optimist Clubs are involved in the Childhood Cancer Campaign where they help raise awareness for pediatric cancer research. They also provide services as needed in their local communities. We believe th Optimist Club is making a difference on Marco Island for young cancer patients and survivors. Sometimes our fellow service clubs can be our best promoters, especially when they have a special interest in the topic. I'm sure that is why the Calgary Toastmasters placed the Optimist Oratorical Contest front and center on their website. The topic for the 2010 contest is "Cyber Communication: Progress or Problem?" Students who have not turned 16 by December 31, 2009 are eligible to participate. Competition begins at the club level where the participant gives a 4 to 5 minute speech and winners advance through zone and regional competition before competing at the District level for a $2,500 scholarship. The Optimist Oratorical Contest teaches students public speaking skills that they will use throughout their lives. Optimist International has conducted this program through their clubs since 1927. They are the only service organization to award scholarships for communications. The Dinner Optimist Club of Calgary, Alberta recently sponsored the First Annual Kids In Motion Fun Run and Walk. The event was a family affair for the benefit of children with Spinal Muscular Atrophy (SMA). The money raised will help supply wheelchair equipment for children. Many of the children in wheelchairs participated in the Family Fun Rock and Roll portion of the event. Click here to see their photo gallery. Optimist Clubs are great at filling needs in their communities. Congratulations to the Dinner Optimist Club of Calgary for filling this very special need for some very special kids. Santa's reindeer are getting ready for the big show and in anticipation of their big day they will be practicing their reindeer tricks at the Annual Tastefest and Reindeer Games sponsored by the Optimist Club of Clinton Township Area, Michigan. What are reindeer games? A spectacular event that benefits the Optimist International Childhood Cancer Campaign. Sponsors can purchase reindeers, dress and race them. Participants can place charitable bets on the reindeer and everyone enjoys a fabulous evening of some of the best food in Macomb County. This sounds like a fun way to welcome the holiday season and serve a great cause at the same time. Download the Reindeer Games and Tastefest brochure here. Are you a parent, teacher or youth group sponsor searching for a new location for a field trip? Do you live near Gretna, Louisiana? Then you are in luck! The Westbank Optimist Club of Gretna, Louisiana sponsors the Gretna Observatory, a perfect location for children and adults to learn with wonder. The Gretna Observatory opened to the public in 2004. According to their website, "the Gretna Observatory is the largest public observatory in the Greater New Orleans area. It was built to promote a greater interest in astronomy. It was especially designed to be an educational benefit to school age children and young adults from local schools by creating an awareness and interest in astronomy, science, and technology." What a great way to reach childrena and share the positive mission of Optimist Clubs. Thanks to the Westmark Optimist Club for helping children to reach for the stars. The Optimist Club of Moline, Illinois has made 100 kids happy with 100 new pairs of shoes. The club has an annual pledge to provide free shoes for students at the Jefferson Early Childhood Center. Recipients are chosen by the teachers at the school. According to club president Pat Wendt, "We do it because every kid needs a good pair of shoes." This year Moline Optimist Club members raised $1,400 for the program. Payless Shoe Stores partnered with them to ensure there money could stretch as needed. Optimist Clubs strive to make a better life for kids. The Moline Optimists are doing their part one pair at a time.